Nobody knew at the time how important it would become, but November 1, 1946, was a key date in Jewish American history. That night, at Toronto’s Maple Leaf Gardens, a new professional basketball league sent the New York Knickerbockers north of the border to face the Toronto Huskies. It was the opening game for the Basketball Association of America—which, three years later, would become the NBA. The starting lineup for the Knickerbockers that night included names like Ossie Schechtman, Sonny Hertzberg, Ralph Kaplowitz and Leo Gottlieb. Indeed, when Schechtman scored the game’s first basket, he did much more than just set the Knickerbockers en route to a 68-66 victory—he also ensured that the first points of what’s become one of the world’s most popular sports came off the fingertips of a Jewish player. But that’s not all. The first player ever to use the nolook pass? Dutch Garfinkel, also Jewish. And so was the only coach ever to take a team to both NCAA and NIT championships—City College of New York’s legendary Nat Holman. Noticing a pattern? David Vyorst, a Washington D.C.-based communications specialist, certainly did. He spent more than three years interviewing subjects like the late Boston Celtics coach Red Auerbach, current NBA commissioner David Stern, sportswriters, historians, and former players like Dolph Schayes, Schectman, Kaplowitz, Hertzberg and Tal Brody. Today, nearly a decade after he first had the idea, his now-completed featurelength film, The First Basket, is making its way through film festivals. (It premiered at the Washington, D.C. International Film Festival in April and is scheduled to show at Jewish film festivals this fall in cities including Dallas, Cleveland and Philadelphia.) Narrated by Animal House star Peter Riegert, the film offers a thorough, well-crafted and absorbing history of how Jews helped turn basketball into the sport we know today—and how the game became part of a whole generation’s acclimation to America. As historian Jeffrey Gurock notes in the film, roughly 2 million Jews came from Eastern Europe to America between 1880 and the outbreak of the First World War. The majority came through New York, and Manhattan’s Lower East Side soon became the largest Jewish community in the world. This was the time of Progressivism, when settlement houses provided a way for working-class immigrants to better acculturate into American society. It was also a time when organized sports were gaining in popularity in the U.S., including basketball, a sport created in 1891 by James Naismith to help keep students active during long winter months. For poor Jewish kids growing up in New York’s tightly packed immigrant neighborhoods, basketball was a sport they could play despite modest means. Hall of Fame Boston Celtics coach Red Auerbach talks about growing up in the Williamsburg section of Brooklyn, where there wasn’t enough land for a football or baseball field. Former Philadelphia Warrior and Brooklyn native Jerry Fleishman describes not being able to afford a ball, and instead tying up a bunch of newspapers and using a specific rung on a fire escape as a makeshift net. In these neighborhoods, basketball just worked better than other team sports. But basketball did more than just give ghetto Jewish kids a chance to compete—it provided an alternative to some of the neighborhoods’ less-than-kosher activities. Jewish gangsters like Bugsy Siegel and Myer Lansky were running big-time rackets in the 1920’s and 30’s. And even in the sports department, basketball’s competition came from the clearly more violent boxing ring. With the game’s accessibility, a “city ball” style of play soon emerged, based on a lot of passing, cutting, ball-handling and player movement. Some of the best Jewish teams began to take that style on the road, barnstorming to play other top teams and becoming stars in the growing sport. Still, the sport kept growing. College basketball became a major draw in the 1930’s and 40’s, with Jewish stars among the best players at programs like City College of New York, New York University and Long Island University. 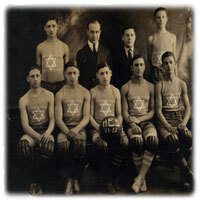 Naturally, when the fledgling BAA began play in 1946, most of the league’s eight teams brought in Jewish players. Moreover, Jewish coaches have had great NBA success. Auerbach, for example, won nine titles as Celtics coach, Holzman coached the Knicks to two championships in the early 1970’s, recently retired Larry Brown has won more than 1,000 games—including both NBA and NCAA titles—and New Jersey’s Lawrence Frank is currently one of the league’s top young coaches. But Jewish players have gradually become far less common. As Jews became better educated and more prosperous, they began moving away from crowded urban neighborhoods and the embedded culture of “city ball,” heading instead to the suburbs. When 18-year veteran Danny Schayes retired in 1999, the NBA endured a stretch with no Jewish players and few have played in the League since. However, as The First Basket notes, basketball has been popular in Israel since the country’s founding. The government invited Holzman to set up a coaching school there and recruited U.S. college star Tal Brody, who became a citizen and key component of Israeli basketball. To this day, the Maccabi Tel Aviv team is a consistent power in the European league. The First Basket succeeds at smartly telling all this history, partly because it doesn’t shy away from the unpleasant parts of its story. And it’s full of great photographs and archival film of basketball through the years, as well as everyday life in the time of settlement houses. Jeff Fleischer is a Chicago-based journalist who has written for publications including Mother Jones, the Sydney Morning Herald, the New Republic, Chicago magazine and Mental Floss.